The Secrets of Top Students Kindle edition is currently the number 1 book in the Student Life and Study Guides categories on Amazon, and number 2 in Study Skills! Thank you for making this sale a success. Remember that you can still get your copy for $2.99 until May 11th! Maja is a Graphic Designer with a passion for Frugal Living. She wants to help people to make their money go as far as possible, and does so with her website DailyProof. As a student, it’s often difficult to fit any kind of employment around your studies. Even if you find a way, trying to make ends meet can seem pretty much impossible! Everyone knows that getting a job while at college or university can help your employability afterwards, but practicalities surrounding actually getting your degree must come first. How, then, should you best make some money to actually maintain your standard of living and get by? First if all, it’s a good idea to get yourself into a habit of reading blogs and websites dedicated to the practice of frugal living. There are some great tips out there, and most aren’t at all time consuming. Not only are they great for providing you with ways to make money, websites such as Daily Proof and even your typical Social Networking sites can help you actually save money, too. From coupons to budgeting, there’s no point in shying away and looking a gift horse in the mouth. Now, these ones are a bit of a given, but it just goes to show that tried and tested methods really work! Whether you’ve got some old clothes flung at the bottom of your wardrobe, or some antiques handed down through the generations that you really see no use for, these websites could indeed be your saving grace. If you don’t really have anything sale-worthy, get customizing! There’s a new trend surrounding upcycling, and it’s a fantastic way to make something shiny and new out of old stuff. It’s environmentally friendly as well, because it’s basically just a glam form of traditional recycling. These are some books sold by the editor of this site for over $100! Following on from the standard sites mentioned above, there are some great sites out there which actually take the hassle out even more (if that’s possible!) from selling on your junk. Just go to sites like De-Cluttr, enter the barcode or specifics of the items you want to shift, and you’ll be given a price. And that’s it! No auctions, no waiting around for someone to commit to a purchase. You’ll be invited to send off your items (from gadgets and CDs, to DVDs and clothes), and once they’ve been vetted, they’ll pay out. On the same level are businesses such as Cash4Clothes, who pay out to recycle your stuff for you, by taking your clothes to places in need. You won’t get much for them, but it’s better than them just sitting there collecting dust, right? If your college is on Facebook, it’s likely that there will be a group dedicated to the students. Find people taking your classes and see whether they’d like to buy your books from you once you’re done. Not only will you make a little back from your investment, you’ll win some brownie points in helping out some of the younger students. Have a yard sale! It may not seem very 21st Century, but sometimes, the oldies know best. As the warmer weather approaches, it’s the perfect time to gather some friends and set up shop (literally) for the day. Be prepared for hagglers – set your prices a little higher than you actually hope for, but not so high that you have them running for the hills. Make some posters and flyers and pepper them around the neighborhood, and you’re good to go! This is a trend that has been sweeping campuses the last few years. A ‘Swap Shop’ might not make you any money per se, but it’s a brilliant way to gain some new essentials just by using the ones you no longer want. Think of it as a giant hand-me-down extravaganza; whether it’s just between your circle of friends, or even spread to a larger audience. Why not charge everyone $3 to enter, have everyone bring 3 good items of clothing that they no longer have use for, and give everyone a ticket to be used in exchange for someone else’s clothes that they do want? The admission can be put to charity or a society event, so not only will you gain a new wardrobe for next to nothing, the rewards can be reaped elsewhere as well. There are an abundance of ways that you can make a little extra cash while you’re studying – you just have to get creative! Want to improve your GPA? 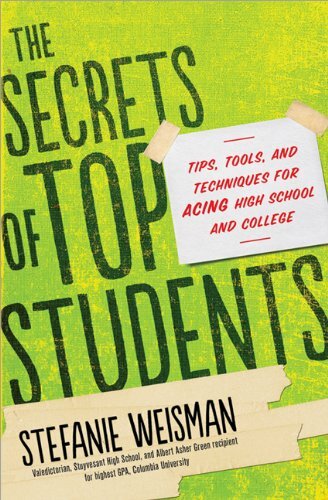 Order your copy of The Secrets of Top Students today!